Australian David Warner hopes England's Jonathan Trott will overcome stress-related issues and return to cricket. 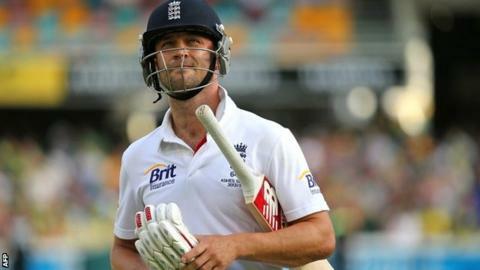 Trott, 32, left England's Ashes tour of Australia in November and this week announced another break from the game. Batsman Warner, who last year admitted he "went a little too far" in branding Trott "weak" said: "I hope he can get through this and get back on the park. "If he does, we'll keep playing the brand of cricket we do, with that aggressive, in-your-face attitude." Trott has scored 3,763 runs at an average of 46.45 in 49 Test appearances and hit nine centuries. But in the recent Ashes series in Australia he only managed a total of 19 runs in two innings during the Brisbane Test in November. Trott has also represented England in 68 one-day internationals and seven Twenty20 matches. Trott, who has scored 3,763 runs in 49 Tests, returned from the Ashes after making 10 and nine in the first match at Brisbane, in which he was dismissed in both innings by fast bowler Mitchell Johnson as Australia won by 381 runs. He attempted a comeback with his county Warwickshire in their opening game of the new domestic season and scored 37 and 26 against Sussex. But he experienced a recurrence of his problems and announced he would continue the support programme prepared for him by the England and Wales Cricket Board. "I have decided it is best for all involved that I continue my recovery on the sidelines for the time being," the South-Africa-born batsman said. Warner added: "If you feel like you can't give 100% and commit 100% then he's done the right thing. "What happened to him last year and what he said in his recent interview shows he's got problems." Regarding his remarks last November during the first Ashes Test, when he said "the way Trotty got out was pretty poor and weak", Warner, 27, said: "I've always been as honest as I can in the media and I'll continue to do that. "My comments were probably over the top at that time, when I didn't know there was a problem with Trott. "But that's in the past now and we've moved on from that."